Look, I know it has dragons and giants, but the majority of Game of Thrones is actually grounded in some pretty brutal reality. 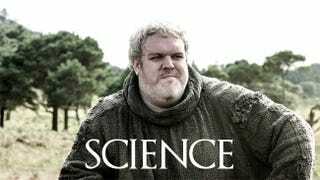 So science can look at someone like Hodor and say, well, maybe he's just a simple giant, but let's try and diagnose his condition anyway. Best-selling science author Sam Kean reckons Hodor suffers from expressive aphasia, a condition caused by "a localized stroke in the front of the brain, on the left side". Hodor, Hodor, Hodor, Hodor, Hodor. Broca described a patient who had a lesion in the left frontal part of his brain and who could only say one word: "Tan." And just like Hodor, Broca's patient came to be known as "Tan"—the single word that he could utter voluntarily—even though it wasn't his actual name. Seems expressive aphasia can also be caused by a brain injury, and its symptoms present themselves as the ability to only say a single word while retaining the ability to understand (and react appropriately) to others. Just like Hodor. And Max Hass.